A simple combination of baguette, garlic, butter and salt, a glistening pile of toasted garlic bread is completely irresistible and makes a welcome addition to a bowl of pasta for a midweek dinner or even just a quick snack at lunchtime. 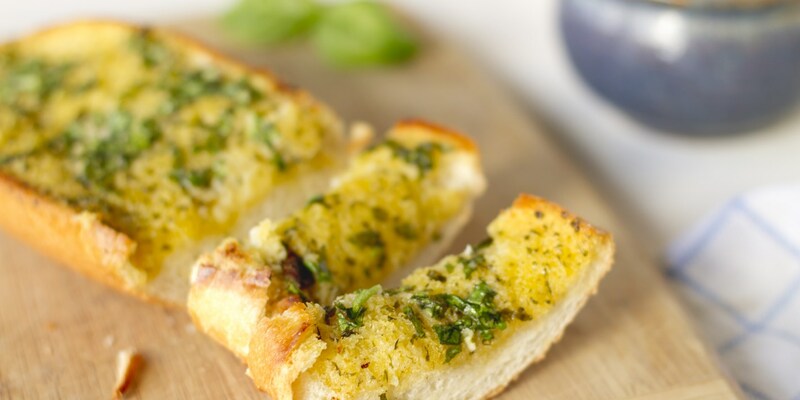 Homemade garlic bread blows the limp, anaemic supermarket variety out of the water and is really quick and easy to make. You can even prepare it in advance and give the bread a final bake just before serving. Try mixing chopped parsley or basil through the butter or topping with a strong cheese such as Parmesan for an extra depth of flavour. You can also try different types of bread – ciabatta or paninis work really well. For a non-dairy alternative, substitute the butter for good quality olive oil. If you fancy a bit of a challenge, try making your own bread. Lisa Allen’s Tear and share garlic bread is fun to make if you have a little more time to give. A buttery garlic bread would go down a treat alongside Luca Marchiori's Passatelli with vegetable ragu or Ernesto Iaccarino's Rigatoni with Neopolitan ragu.